Last year my mum, myself and lots of lovely local ladies knit up lots of lovely daffodils which we then sold on Daffodil Day for the Irish Cancer Society (full details here) It was a huge success, so much so that this year the Irish Cancer Society have asked me to make the pattern available for more people to get involved. Daffodil Day is a yearly event in Ireland whereby daffodils are sold in order to raise money for the Irish Cancer Society. You can find out lots more information here on their official website and how you can get involved in fundraising. This year’s Daffodil Day is on 28th March and we would love you to get involved, by stitching some lovely daffodils that will then be sold to raise money for the Irish Cancer Society. 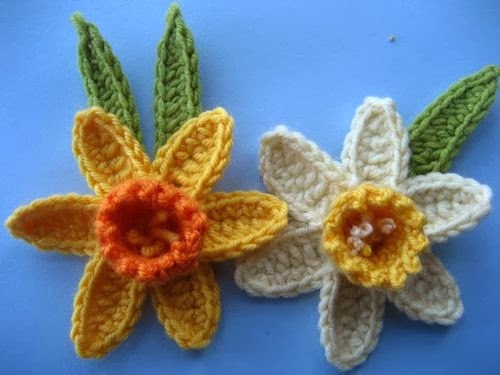 In Roscommon (Ireland) we are asking you to knit and make up your daffodils, then place them in a plastic bag (ideally with your name and the amount of daffodils you knit written on a piece of paper in the bag) and drop them off to the Coffee Morning on 14th March in JJ Harlows Bar, The Square, Roscommon. They will then be sold on Daffodil Day (28th March). If you are outside Ireland and wish to take part that would be fantastic, simply comment below with your email or email me direct at michlle AT michellemadethis DOT com and I can give you my address to post the daffodils to). If you have any questions at all please feel free to comment below and I will get back to you as soon as possible. In the meantime let’s get stitching!! Break yarn* and place on spare needle or holder. Repeat from * to * 4 more times until you have 5 petals. Cut thread and use tail to thread a darning needle. Insert the needle through the stitches and secure. This forms the flower. You will need to sew a few stitches to join the last petal with the first. Then weave in all the end. It is essential that you weave the ends in and do not simply snip them off as it will not look as neat and is likely to unravel. fund-raising but please do not knit up for commercial purposes (ie to sell for personal gain). At the same time you can attach the stem to the back of the petals and then stitch a safety pin in place so it can be worn as a brooch. Kniting a complete daffodil and sewing it together takes approximately 45 minutes and I wouldn’t say I am a very fast knitter. I find knitting as many petals as I can on circular needles makes the process a little quicker. If you are in a knitting group why not share it out. 1 person could knit stalks, 1 person could knit petals, 1 person could knit the trumpets and another person sew them up? We used small safety pins as the brooch part and they are just fine. You can buy them very cheaply in discount stores or 2 euro shops. If you have any other comments, tips or tricks feel free to comment below. 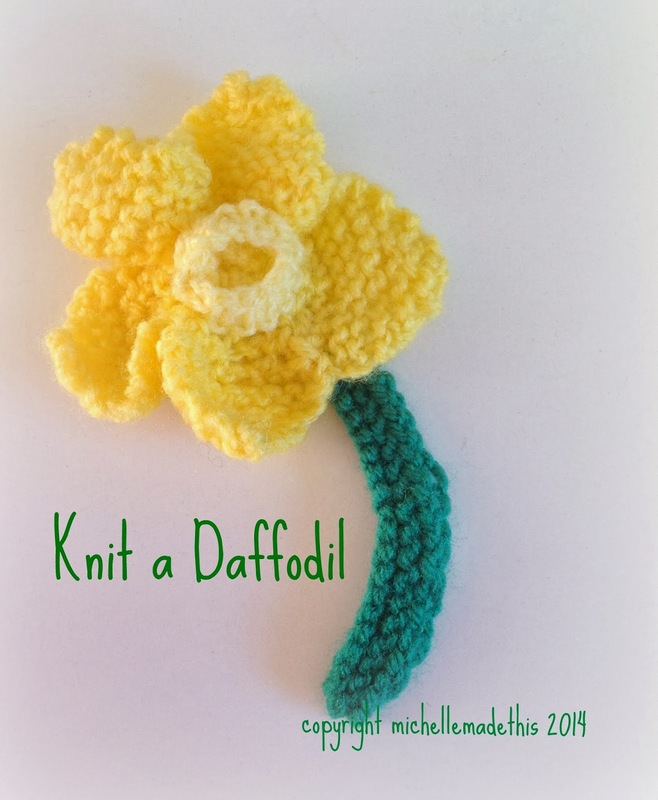 I am thrilled to say that since posting this I have had lots of people getting in touch saying they are going to knit the daffodils which is fantastic. I have also had people asking for a crochet pattern. I am delighted to say that I have one for you. 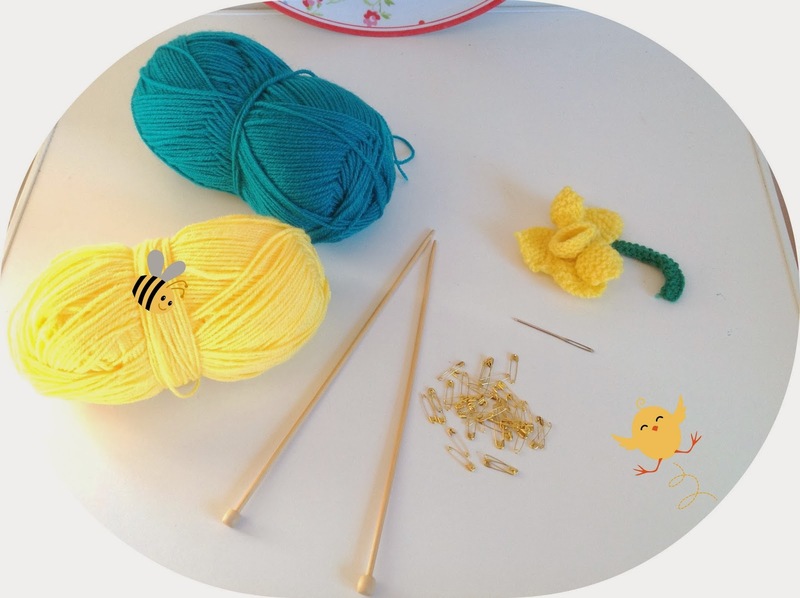 The lovely Lucy from the beautiful blog Attic24 has given permission for her crochet daffodil pattern to be used for the purpose of selling along with our knitted daffodils on Daffodil Day. 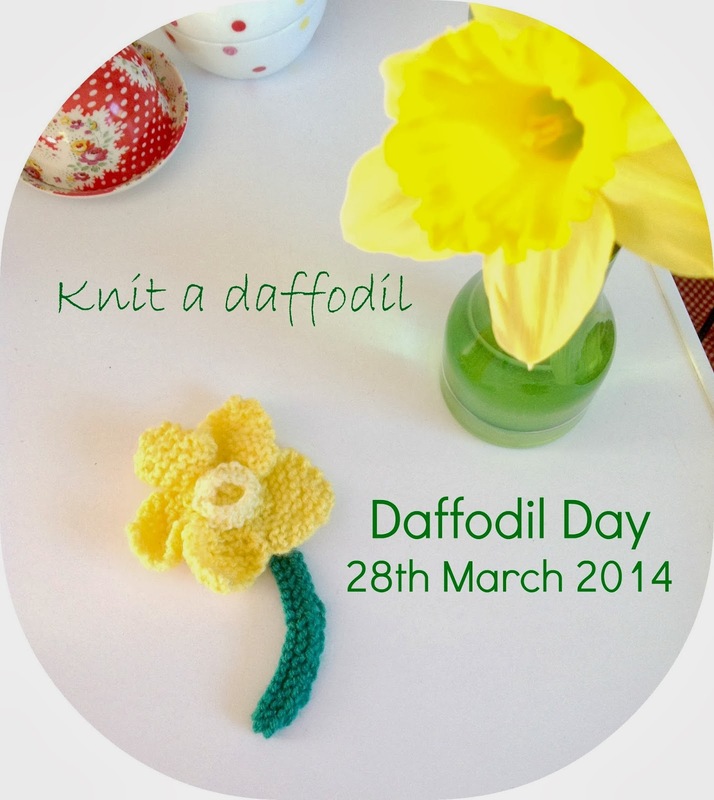 You can find the pattern and step by step instructions on how to crochet the daffodil here. Any info on where to send this? The charity site doesn't mention this. Thanks! Hi I made a few of those today and last night and modified your pattern just slightly, as I'm not a fan of sewing: instead of casting off when petals are finished and 7 sts on needle, I double the stitch number again (knit front and back) to get back to 14 sts and knit 4 rows before casting off so no need to sew the trumpet to the petals, just a few stitches to sew to close trumpet and join the edge petals. Then I pick up 5 stitches in back of daffodil and using green yarn, knit the stem for 8cm using icord method (Works with circular or 2 double pointed needles). would I be able republish your pattern on the Dublin Knit Collective website? I'd love to make some, I also hope to make hats for heros (for children with cancer). Thanks for sharing the pattern.